Was there anything special about the Ukrainian president’s visit to Moscow, marking his first foreign visit? Russian experts focused primarily on the Ukrainian leader’s decision to appoint Yulia Tymoshenko as acting prime minister. Their next concern was how the crisis of Russian-Ukrainian relations, stemming from the Ukrainian presidential campaign, could be resolved. 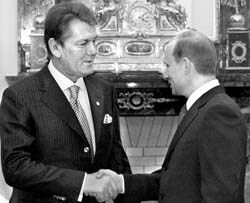 Finally, they tried to figure out what the meeting in Moscow between Viktor Yushchenko and Vladimir Putin was likely to bring about. The Russian leader did not have any illusions from the outset. The top-level meeting had to be arranged at the last minute, and the two heads of state didn’t have enough time to resolve countless matters, ranging from personal to postwar issues to the current agenda, namely Kyiv- Moscow cooperation. After completing their talks, the Ukrainian and Russian presidents stated they were satisfied with them. Vladimir Putin thanked his Ukrainian counterpart for what he described as a “constructive approach” and said that both presidents would instruct their cabinets to work out proposals to further bilateral relations. These proposals will most likely be ones that address key aspects of bilateral cooperation, which were discussed during the press conference. It’s hard to say how solving these problems will satisfy Ukraine’s national interests. Viktor Yushchenko’s statements seem to indicate that he will be following the political course set by the previous administration. Another possibility is that the new president had to make such statements, in view of the post-campaign impact on Ukrainian-Russian relations. Viktor Yushchenko had to build bridges to Russia, Ukraine’s “lasting strategic partner.” This begs another question: Was Mr. Yushchenko the one who designed these bridges? Also, who will be the first to meet the other halfway? Various experts have offered different views on Viktor Yushchenko’s statements concerning Ukraine’s membership in the Single Economic Space or the Odesa-Brody oil pipeline reverse mode. The president supports the idea of “formalizing” relations with Russia in the SES format: “We are not discarding the SES idea.” Meaning what? How will Ukraine continue to be involved in the project? Mr. Yushchenko’s “formalizing” approach to cooperation offers no straight answer to a straight question. Formally, all the SES instruments are markedly ambiguous. If this project is implemented as the Kremlin intended (e.g., a customs union and supranational authorities), Ukraine can kiss EU membership goodbye. Ukrainian Foreign Ministry Spokesman Markiyan Liubkivsky shed more light on the SES talks with Russia last Wednesday, saying that “the SES must not prevent Ukraine from implementing its strategic interests, particularly in the economic sphere, for these interests are also in Europe.” He added that it was precisely the subject discussed by Vladimir Putin and Viktor Yushchenko in Moscow. Solving these problems has a direct impact on the implementation of Ukraine’s foreign political course aimed at Europe. President Yushchenko described the European choice as a priority in his foreign policy endeavors. Until now, European diplomats have made no secret of being confused by the former Ukrainian leadership’s approach to the SES and Odesa-Brody’s reverse mode. Even though Brussels is still silent on the subject of Ukraine’s membership, it is clear that European politicians are now closely following Kyiv’s responses. Most experts agree that there are no grounds for excessively criticizing Viktor Yushchenko’s statements. The new president needs time to make final decisions that best satisfy the national interests of Ukraine.